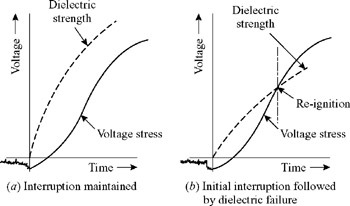 While interrupting highly inductive current, like no-load current of transformer, the rapid deionization of contact space and blast effect may cause current interruption before its natural zero. 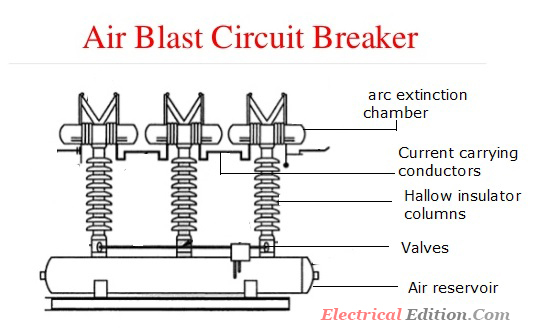 Such an'interruption of current before its natural zero is termed as “current chopping”.This phenomenon is more pronounced in case of air-blast circuit breakers which exerts the same deionizing force for all currents within its short-circuit capacity. Even though, the instantaneous value of current being interrupted may be less than the normal current rating of the breaker, it is quite dangerous from the point of view of overvoltages which may result in the system. The electromagnetic energy stored in the system at the instant before interruption is 1/2(Li²) As soon as the current is interrupted the value of i becomes zero. But, the electromagnetic energy stored in the system [1/2(Li²)] cannot become zero instantaneously and so it is converted into electrostatic energy [1/2(CV²)] as the system has some capacitance. This theoretical value of V is called as “prospective Voltage or Arc Voltage”. If this voltage is very high when compared with the gap withstanding voltage, then the gap breakdowns and so "the arc restrikes. 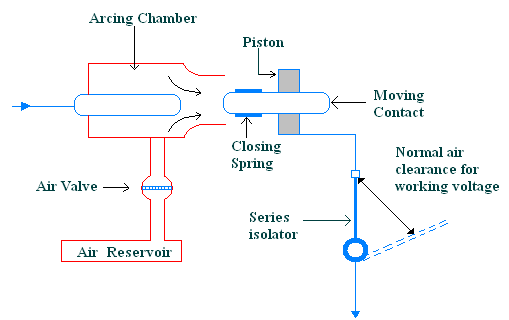 Again the current is chopped (interrupted) because of high quenching force and so, restriking occurs. This process repeats until the current is suppressed finally without any restrike and this occurs near current zero as shown in the figure. In actual proactive the voltage across the breaker does not reach dangerously high prospective values of voltage. It is due to the fact that as soon as the breaker voltage increases beyond the gap withstanding voltage, it breaks down and the arc restrikes due to which the voltage across breaker falls to a very low value of arc voltage which can also be seen in the figure. Hence, it can be said that the arc is not an undesirable phenomenon and instead it protects the power system from severe stress on insulation due to overvoltages. In order to reduce the phenomenon of current chopping, the overvoltages are to be reduced. This is possible by connecting voltage— grading (or non—linear) resistors across the circuit breaker contacts during arc interruption. In medium voltage systems, an RC surge absorber is connected across line and ground in between the inductive load and the circuit breaker. As a result, the RC combination absorbs the overvoltages. 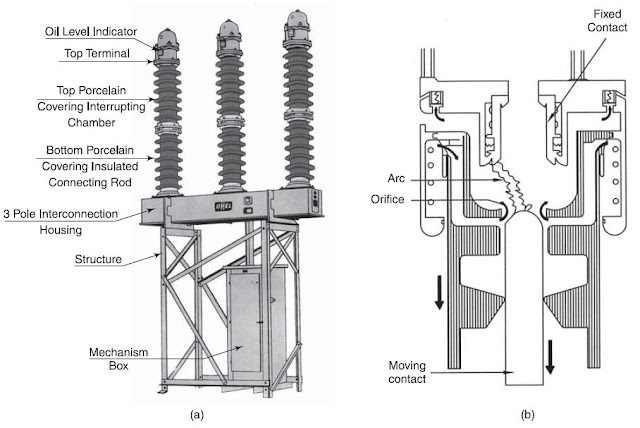 Whenever a fault occurs on the system, the contacts of the circuit breaker are opened. As soon as a fault or short circuit occurs on the system, there is a heavy in rush of current through the contacts liberating heat, causing the temperature rise. Due to temperature rise, electrons are emitted from the cathode. This happens during the period of separation. The air surrounding the contacts already consists of electrons, positive ions and neutral molecules. These electrons emitted from the surface of cathode get ionized with the air. When the contacts are opened, due to ionization an arc is struck in between. A small p.d exists between the contacts and is responsible for maintaining the arc. The current continues to flow as the low resistance path is provided by an arc. It is clear from above analysis that current flow entirely depends upon the resistance of arc. To extinguish the arc, the factors responsible for are maintenance are to be taken into consideration. 1. The are persists mainly because of the p.d developed between the contacts which is small but sufficient to maintain the arc. 2. 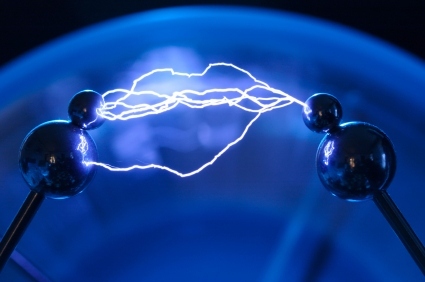 Moreover, the ionization process which is taking place between the electrons emitted from cathode and the electrons and positive ions present in air helps the surrounding air to fill with ionized particles. 1. Firstly, the p.d between the contacts is decreased, so that the arc is avoided. It is possible [by moving the contacts of a CB to a certain distance where p.d fails to build-up for the maintenance of are. 2. Secondly, the ionized particles present between the contacts and surrounding air are to be swept out either by cooling or by passing gases which are highly electronegative in nature. A plain-break oil circuit breaker involves the simple process of separating the contacts under the whole of the oil in the tank. There is no special system for arc control other than the increase in length caused by the separation of contacts. The arc extinction occurs when a certain critical gap between the contacts is reached. The plain-break oil circuit breaker is the earliest type from which all other circuit breakers have developed. It has a very simple construction. It consists of fixed and moving contacts enclosed in a strong weather-tight earthed tank containing oil up to a certain level and an air cushion above the oil level. 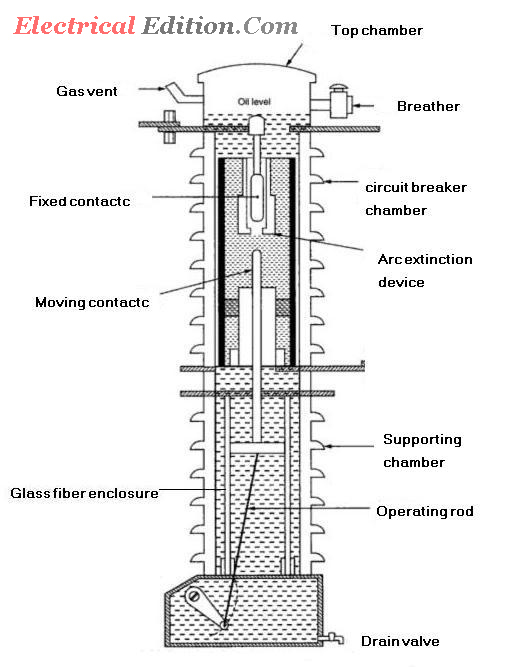 The air cushion provides sufficient room to allow for the reception of the arc gases without the generation of unsafe pressure in the dome of the circuit breaker. It also absorbs the mechanical shock of the upward oil movement. 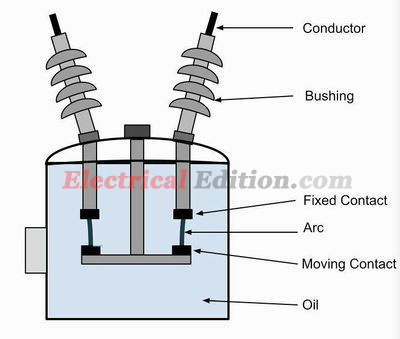 Fig.1 shows a *double break plain oil circuit breaker. It is called a double break because it provides two breaks in series. (i) The hydrogen gas bubble generated around the arc cools the arc column and aids the deionization of the medium between the contacts. (ii) The gas sets up turbulence in the oil and helps in eliminating the arcing products from the arc path. 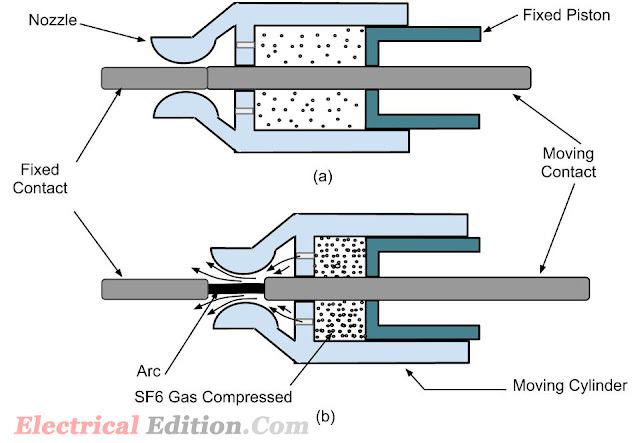 (iii) As the arc lengthens due to the separating contacts, the dielectric strength of the medium is increased. The result of these actions is that at some critical gap length, the arc is extinguished and the circuit current is interrupted. (i) There is no special control over the arc other than the increase in length by separating the moving contacts. Therefore, for successful interruption, long arc length is necessary. (ii) These breakers have long and inconsistent arcing times. (iii) These breakers do not permit high speed interruption. Due to these disadvantages, plain-break oil circuit breakers are used only for low-voltage applications where high breaking-capacities are not important. It is a usual practice to use such breakers for low capacity installations for voltages not exceeding 11 kV.